Time for another game of I Ain’t Been Shot, Mum! with John and Dave…but what to play? 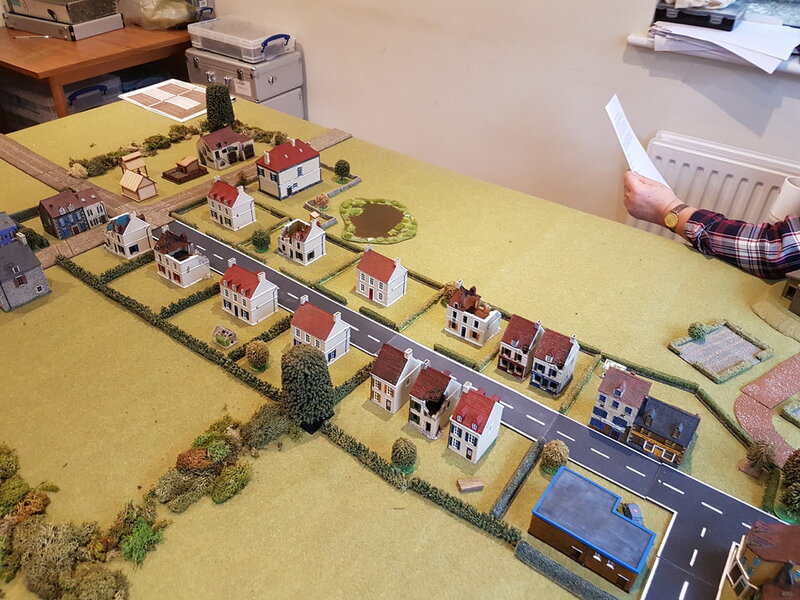 Dave has requested an early war encounter, so a quick look back through my library of scenarios and I settle on one of Richard Clarke’s games: Lille. The premise is simple: Rommel’s Germans are advancing rapidly on Lille, aiming for the village of Lomme, whose capture will seal off the escape route of all English and French forces in the area. The Allies have realised what the Germans are up to, and have dispatched a small force to hold Lomme for as long as possible. The scene is set for an epic clash! The village of Lomme is shown in the photo, above. 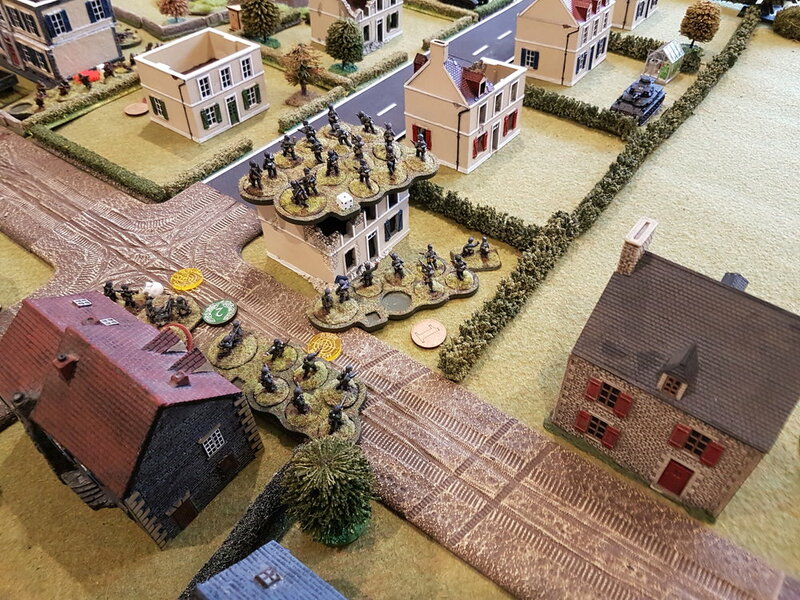 The Germans will enter from the south (the right), anywhere along the table’s edge. The French start anywhere they like on the table, and must prevent the Germans from exiting any troops to the north i.e. along the single road leading to the left. The Germans disposed two strong, truck-mounted platoons of infantry, each four squads strong, with each squad having 8 men. Their Company HQ contained three MMGs, an anti-tank rifle, and another squad of infantry. Accompanying them were two PaK 35 anti-tank guns towed by Kfz15 field cars. Finally, four Big Men would command the German infantry: more than enough to make sure everything ran smoothly. Panzer reinforcements were due to arrive after six appearances of the Turn card: a zug of four Panzer II and a zug of three Panzer IV. Each zug had its own Big Man. The French also had two platoons of infantry, but their platoons each had three squads, with ten men per squad. They had two MMGs, and had also been assigned two ageing soixante-quinze field guns. Unfortunately, the French only had two Big Men to command the above: the aforementioned Capitaine Legume, and the superb Sergeante-Chef Aubergine , hero of a previous action. The French briefing also contained the promise of two platoons of tanks: three R-35 and three Char B1 bis tanks. I couldn’t, however, find any mention of when they were due to arrive, and suspected, therefore, that they were a cruel jest on the part of Mr Clarke and destined never actually to grace the tabletop with their presence. I unpacked the models anyway, and decided to decide if and when they arrived depending on what would give the best game! Initially Major von Skinner thought he might split his force and advance onto the table along each road leading to the north i.e. at either end of the village. His force wasn’t really strong enough to bring that off, however, so he decided upon an awesomely bold plan: he would left hook with his entire force, aiming to capture the crossroads on the west side of the village and then, dependent on what the French were doing, either drive straight off the table for Lille or roll up the enemy line from the flank. Capitaine Legume, with such a huge frontage to protect, did split his troops. 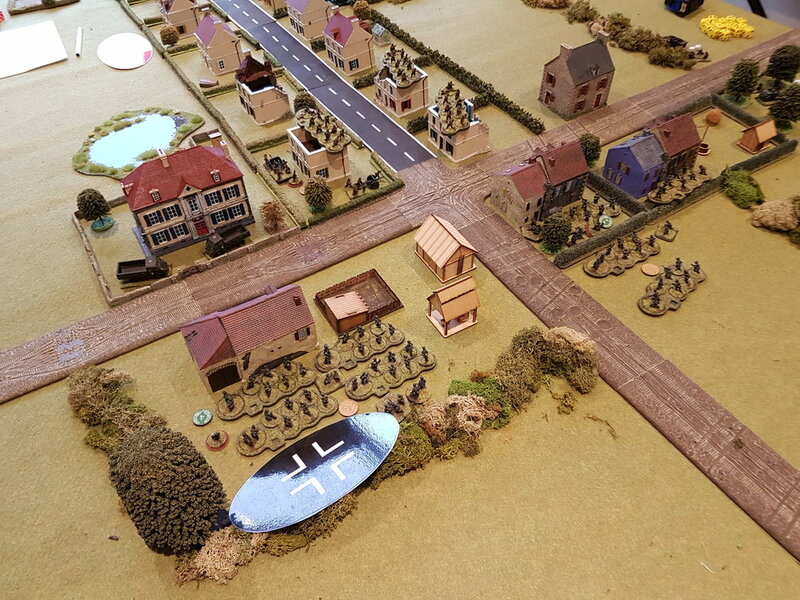 Half, including the two field guns, would protect the crossroads to his right; half would be positioned in the houses approximately in the centre of the table: ready to kill Germans wherever they appeared. 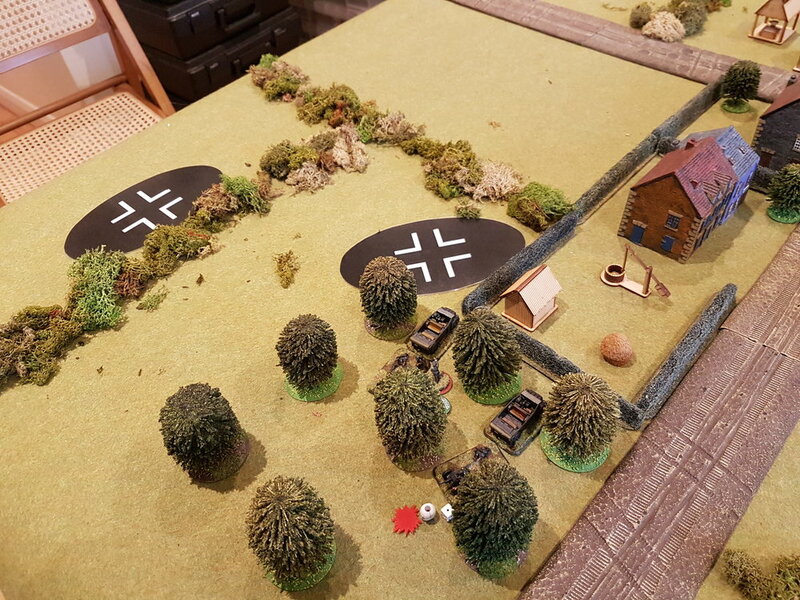 The game began with the first of the German Blinds advancing on to the table towards the crossroads. Hoping to spot and pour fire onto the Germans as soon as possible, wearing them down at distance, the French platoon defending the crossroads deployed immediately. Initially, the French tactics of immediate deployment had some success. The two German anti-tank guns had advanced into the grove of trees near the road and deployed. This was a bad mistake, as shells from the French field guns quickly blew one gun and its crew apart, with the other limping away out of sight. First blood to the poilu! Then, however, it all went wrong. With some incredibly fast movement (Rapid Deployment and some amazing dice rolls! ), the German Blinds followed their plans and began to outflank the French position at the crossroads, a move completed when the Blinds decloaked as the two German infantry platoons! The French were caught by surprise and suffered badly. Their first platoon had been well and truly outflanked, and the Germans took full advantage. Two platoons fired on one, and the field guns and French infantry squads at ground level suffered badly from being shot at from the upper stories of the houses overlooking their positions. Sergeant Aubergine brought the other platoon back to the crossroads, occupying the large manor house just to the north, and, for a time, things got a bit more equal, especially when a shot from the last remaining French field gun set the large barn opposite the manor house on fire. Unfortunately, the French first platoon had just about ceased to exist by now, and the field guns didn’t last much longer: again it was two platoons versus one, with the Germans now close assaulting to clear the French infantry from the houses. It was now that the Turn card dictated that the German tanks would arrive. John duly brought the Panzer II platoon on to join the troops assaulting the French position on the crossroads, and brought his Panzer IVs on in the centre of the table, protecting his right flank and hooking around the French left. I looked at the table. 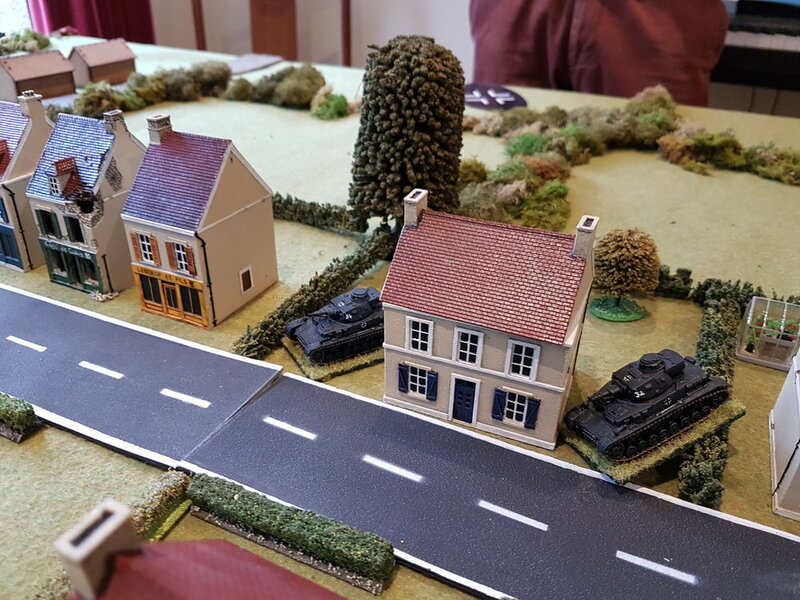 It was obvious that the Germans were a hair’s breadth away from winning, even without all their armour…so I decided to allow the French tanks onto the table as well. Perhaps they would save the day for Capitaine Legume. 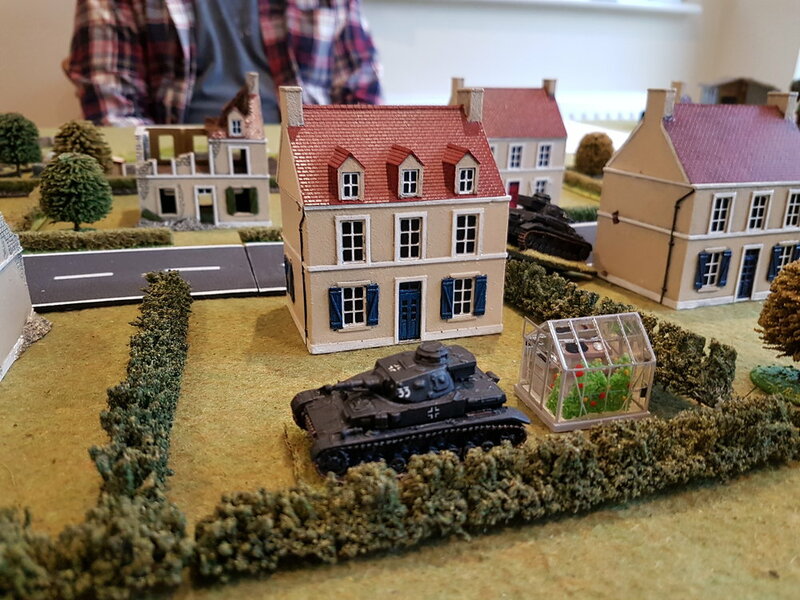 I didn’t want to be too unfair to John, however, so decided that the French tanks would arrive along the road at the opposite end of the village. That way some more of my terrain might get used as well! Dave duly deployed his tanks, but was horrified to be reminded that all his armour was designated as Slow. That’s -2 per dice rolled for movement unless you’re on the road. No tactics here then: just a Stonne-like cruise up the High Street relying on the thick armour of the Char B1s to protect them as they advanced. And if what happened at Stonne was a guideline, then actually that didn’t seem too bad. Unfortunately, this wasn’t Stonne. The lugubrious advance of the French tanks allowed two of the Panzer IVs to get into position, and their combined fire forced the lead B1’s crew to bail out. By this time, the Panzer IIs had arrived in the vicinity of the crossroads. One of them, #14, had a shot down the road at the second Char B1. A 40mm cannon versus a Char B1 at a range of almost 500 yards: no chance! Well, the Panzer II hit, rolling four dice for penetration versus the Char’s eight dice. Three penetrations for the Panzer II, no saves for the B1: boom! What an incredible shot! Panzer II #14, on the road at the bottom of the picture, opens fire! And that, as they say, was that. The French Force Morale had run out, and the survivors either surrendered or ran for it. The Germans had won the day. A great game of I Ain’t Been Shot, Mum! won fair and square by bold German tactics from John. Dave didn’t do anything wrong, in fact he fought a good defence, but once his enemy were round his flank, it was only a matter of time before the left hook took him to the canvas. My favourite shot of the game: Achtung Gewächshaus! Just for the record, the game was actually a bit closer than the above account implies. John had rolled really badly for his Force Morale, and the few losses that he did take were worrying. It was obvious that his men thought they were too far out in front of the main thrust, and should pull back to consolidate. Luckily for him, his morale lasted long enough to win the day…but only just!